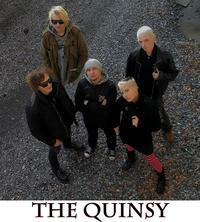 The Russian post-punk band THE QUINSY was formed at the very beginning of XXI century by Vladimir 4.44 Tkebuchava. The band started performing in several Saint-Petersburg underground clubs, such as RED CLUB. But mostly, there were only small electrowave underground parties, as back then the band sound was close to electronic one. In 2005 the Quinsy experienced a lot of hardships and was nearly at the end, but eventually the new members and new sound contributed to the band’s complete revival. The very first newborn performance was set in 2007. The Quinsy frequently participated in Saint-Petersburg gothic-festivals and other rock-shows. From that time, the sound of the band was changed completely to rock, post-punk, gothic and psychedelic. At the beginning of 2008 the band undergone numerous line-up changes. The Quinsy had taken part in various festivals, put on plenty of shows in Saint-Petersburg, Moscow and other cities. On 06.10.2011 the band put on a fantastic show to celebrate the tenth anniversary at Saint-Petersburg Zoccolo club. The Quinsy officially released two records. 2010 saw the live compilation «The Quinsy at concerts vol.1», in 2011 there was a release of «The Violet Day» which included two remastered tracks from the previous time. All the songs lyrics were written in English. The Quinsy were playing along with such popular bands as Last Days of Jesus and Two Witches. Till present time the band keeps on playing and holds firm position on the underground scene. The band is well known and loved in Russia.